"Among the beds of bright flow ers and cool fountains of my Alice library garden, this edition illustrated by the French artist Benjamin Lacombe, and also published in Spanish by Edelvives (Alicia en el País de las Maravillas, 2016, ISBN: 978-8414002162), is one of the coolest doorways. In our journey as readers, we can experience a precious combination of papers and textures, graphic interventions, words and pictures in conversations, and plenty of sur-prizes! Texts play on the pages in different sizes and movements, marking new paths for the traveler. Pictures adventure in many tracks, while black-and-red ink drawings dance among the words, playing with Alice’s choreographies of falls and transformations, lips and red shoes. 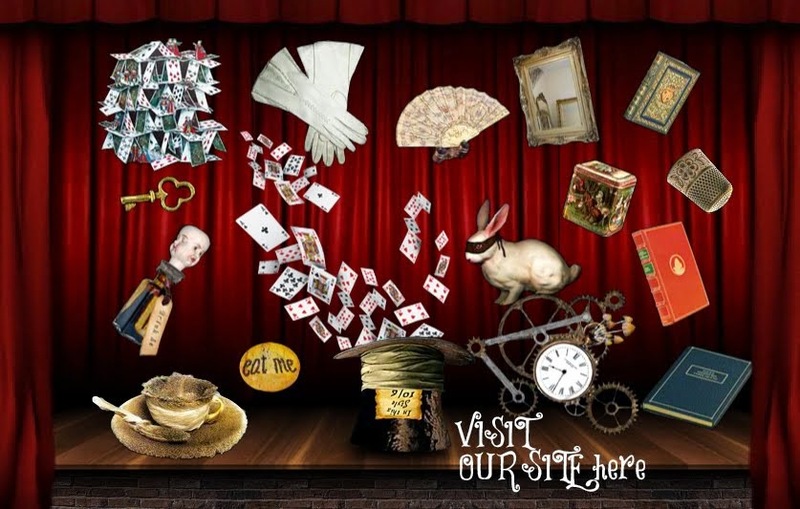 Presenting the key encounters of Alice with the bizarre Wonderland crea-tures are amazing paintings, mixing layers of gouache and oil, mysterious alicinations emerging. In the elaborate nightmarish palette of the pictures, the blur effect in the borders is also a beautiful and subtle presence. It brings us into a dreamy and ambiguous state, also simulating a photographic lens where focus plays with depth and brings us in close to the scenes, like lucid voyeurs traveling into someone else’s dream. 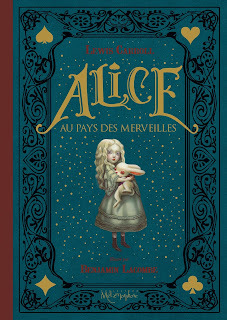 The story of Lewis Carroll and Alice Liddell in the introduction— many of his letters are present in this edition—calls attention to the universe of affection and longing, which becomes a thread along the labyrinths within. 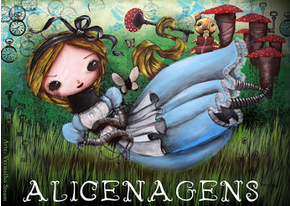 Alice has already participated in other of Lacombe’s adventurous books, installations, and exhibitions, traveling along fairy-tales, magic spells, mythological creatures, and dreamy landscapes, such as in his Etrange bestiaire (Albin Michel, 2015) and pop-up Cuentos-Silenciosos (Edel- vives, 2010). 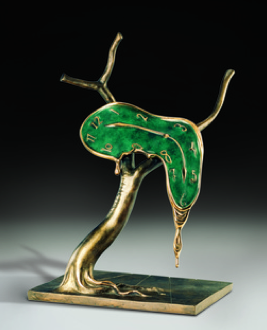 His alicedelic dreams invite us to a garden that is open as a temenos, which often resembles a symmetrical rose garden with a fountain in the middle. 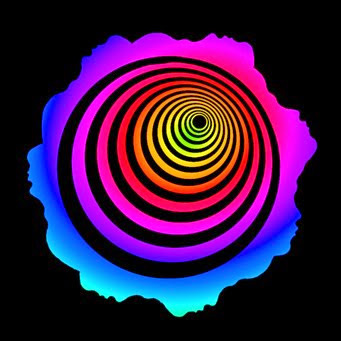 According to Carl Gustav Jung, it is a magical circle where an encounter with the unconscious can be had, and psychic content brought into the light of consciousness. It flowerishes in a place where our imagination and creativity can play with symbols, archetypes, and arcane games, adults becoming children becoming adults. Like dreams inside dreams, we face here the Tennielesque tread converted into a rhizome, where memory plays among the pictures like cards flowing into the air, mixing references to art history and contemporary Alice phantasmagorias. Arthur Rackham nightmares meet Tim Burtonesque Underland and the nymphets of Balthus, while Pop Surrealist sweet girls with huge eyes and dark overtones are able to dare journeys into shadows and subtle eroticism. Pictures play with the text, and with our memories and longings as well. Alice’s body challenges the boundaries of the book, unfolding in space and imagination, while she grows as tall as the largest telescope ever seen and later expands to the maximum, daring the constraints of the Rabbit’s house to stop her. So the book unfolds gracefully to give flow to Alice’s extremes, overflowing the boundaries of the book and inviting us to think outside the proverbial box. Cards flow, unfolding the pages and layers of dreams into the dream that life is." Text originally published at Knight Letter Number 97. Magazine of The Lewis Carroll Society of North America.